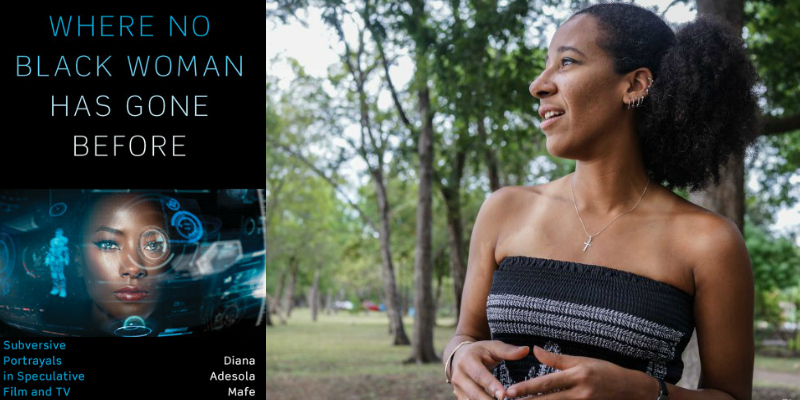 Professor, scholar, and gamer Diana Mafe is an explorer. As the author of Where No Black Woman Has Gone Before: Subversive Portrayals in Speculative Film and TV, she investigates how black female characters in speculative narratives became sociopolitical symbols of their time. Using black feminist theory, history, and psychoanalysis, Mafe makes the case for black women in 21st century speculative film and television in an attempt to decode if we're truly receiving fresher depictions in this post-Uhura renaissance. Mafe insists that there have been Black women characters in recent years that define what it means to be "primary and radical" in the cross landscape of Black womanhood, speculative storytelling, and representation. With case studies from 28 Days Later... (2002), AVP: Alien vs. Predator (2004), Children of Men (2006), Beasts of the Southern Wild (2012), Firefly (2002), and Doctor Who: Series 3 (2007), Mafe in great detail accentuates "a rarely acknowledged fact--that black female characters can be symbols of social progress, vital players in the face of disaster, and complex cinematic agents." We talked about black female heroism and why the speculative genre is so important to the future of Black creativity. What is it about speculative work that allows us to see aspects of being black and being a woman combined that we don’t see in other genres? The speculative genre gives us the most imaginative license, especially when it comes to social constructs like race and gender. This genre is not bound by any history or so-called reality, only by the imagination. When it comes to representations of black women, this is a genre where anything is (or should be) possible. Of course, fiction is still a product of its time, place, and context. And speculative film and television has historically been the purview of white men, whether in terms of directing, writing, or target audience. But this genre has also been instrumental in showcasing black women in new and empowering ways, as a character like Uhura (Nichelle Nichols) on Star Trek proves. My book is about looking beyond Uhura to see where this genre has taken black women in the new millennium. Selena is brought up a lot in discussions of Black women in horror cinema but as you report, not utilized much in academic inquiry. What was it about her character personally that drew you to write such an in-depth analysis? 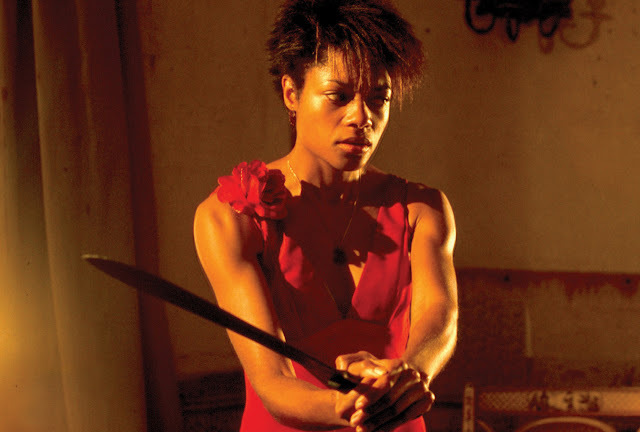 Selena (Naomie Harris) normalizes black female heroism, particularly in a zombie apocalypse. What I love about her character is that she first shows up (Molotov cocktail and machete in hand) to rescue Jim (Cillian Murphy), the white male lead, and she makes this action not just plausible but entirely believable. As I discuss in the book, Selena stems from earlier cinematic characters like Ben (Duane Jones) in Night of the Living Dead and Lisa (Rosalind Cash) in The Omega Man. But she also fulfills the potential that those characters could not within the constraints of their respective roles. For one thing, Selena survives. She makes it through the apocalypse, saves her companions along the way, and balances a range of seemingly contradictory roles—savior, executioner, lover, mother, fighter, and friend. She is savvy, attractive (but never hypersexualized), and an obvious leader. As black women in horror cinema go, she is iconic. It’s easy to watch 28 Days Later and conclude that the film doesn’t make good on Selena’s promise as a character. In other words, we seem to eventually return to stereotypical gender roles where Jim displaces Selena as the primary heroic figure. But I argue that this is not the case—she is the constant hero from her opening shot to her very last scene. Looking towards the future of speculative film and television, are you excited about more Black men and especially women getting the opportunity to tell stories for large audiences in this realm? I am excited and hopeful. Granted, the vast majority of black characters in speculative film and television are still created by white and predominantly male writers and directors. This is true for all my case studies and reflects the general trends of British and American cinema. But the fact that black women and men are being imagined and brought to life in speculative cinema is still incredibly important. There are some very recent and radical examples that we can turn to—ones that came out after my book was finished. The new Star Trek: Discovery features a black female lead (Michael Burnham played by Sonequa Martin-Green), which is unprecedented for the Star Trek universe. The acclaimed horror film Get Out has a black male lead (Chris Washington played by Daniel Kaluuya) and a black male director (Jordan Peele). The upcoming film A Wrinkle in Time is another wonderful example. Although the original novel was written by Madeleine L’Engle, a white writer, the new film adaptation is by a black female director (Ava DuVernay) and casts Meg Murry (Storm Reid), the protagonist, as a child of color. The historical tendency has been to imagine beloved characters from fiction, even speculative fiction, as white. But films like this one encourage us to think more broadly and inclusively—they show us that stories, especially fantastical ones, belong to everyone. And I would be remiss if I didn’t mention Black Panther, which just had a blockbuster debut. Here we have a black superhero, Black Panther (Chadwick Boseman), surrounded by a black cast in a film by a black male director (Ryan Coogler). Again, we can trace the origins of the character to white visionaries, Stan Lee and Jack Kirby. But it is groundbreaking to see Black Panther and what he represents being claimed in such a powerful way by black people behind the camera and by audiences across races. From your research, how do Black storytellers offer truly unique perspectives to speculative work? Black stories and storytellers can only enrich our collective imaginings about speculative universes. And whether we look to the oral narratives of precolonial African societies or the Afrofuturism of contemporary writers, we do not lack for such stories. Hopefully those stories will continue to thrive even as black storytellers create new narratives, not only for bookshelves but for the big and small screens as well. Diana Adesola Mafe is currently an Associate Professor at Denison University in Ohio. You can purchase your copy of Where No Black Woman Has Gone Before: Subversive Portrayals in Speculative Film and TV at the University of Texas Press website or Amazon. Find out more about Mafe's work on her website.